Global stock markets rose Wednesday on optimism over US-China trade talks, while the pound gained on the dollar amid hopes that British Prime Minister Theresa May's new political gamble could avert a messy "no deal" Brexit. Market watchers cited rising hopes that Washington and Beijing were close to finally sealing a trade agreement that averts higher tariffs. "The momentum certainly seems to be continue to be on the upside," said Bill Lynch of Hinsdale Associates. "There's more positive sentiment with respect to a possible deal between the US and China." 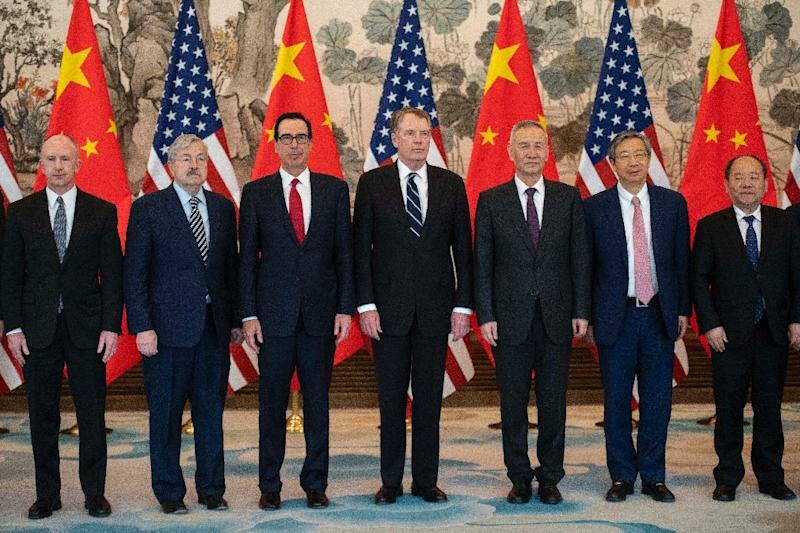 Analysts pointed to a report in The Financial Times that said the United States and China had resolved most issues and that trade talks resuming Wednesday in Washington could be "potentially climactic." "Clearly, the stock market continues to look at those negotiations with a glass-is-half-full mentality," said Briefing.com analyst Patrick O'Hare. Leading bourses in Asia gained more than one percent, while Frankfurt and Paris also posted solid gains. The advance was more modest in London and Wall Street, with the latter affected by lackluster reports on services sector activity and private-sector hiring. Sterling won a boost after Conservative leader May declared late Tuesday she would look for another Brexit delay and softened her position ahead of Britain's scheduled departure from the European Union next week. "The announcement was win-win for the pound," Oanda analyst Craig Erlam told AFP. "Not only did May re-affirm her opposition to no deal, she's technically opened the door to a softer Brexit. I say technically because a lot now has to happen for that to be delivered, including the Conservatives and Labour working together towards an uncharacteristic compromise." However, he added: "If this fails, I struggle to see how she recovers; it very much feels like a last-ditch, desperate gamble." Representatives for May and Corbyn both described a meeting on Wednesday between the two sides as "constructive." May's divorce deal with the other 27 EU nations has been rejected three times by parliament and patience is wearing thin in Brussels as an April 12 deadline to end Britain's 46-year membership nears with no agreement in sight.